Fitzpatrick Malaxator, mixer-extruder. 6" diameter x 3-1/2' long sanitary stainless steel barrel with split opening for cleaning. 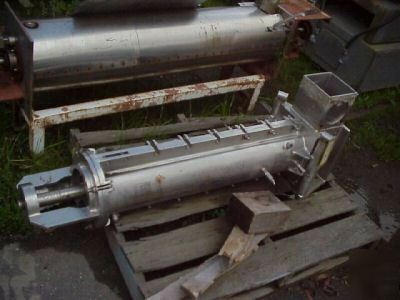 Last used on continuous mixing of bread dough in a crouton plant. Has capability of direct steam injection and liquid addition. Mounted on polished steel stand. No drive motor or feed screw.